Today we went into the surrounding neighborhood and shared the Gospel in 5 homes. 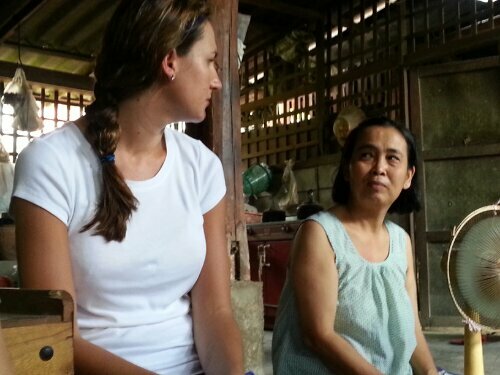 The first lady, Sinuan, already knew the Lord, so we just encouraged her and prayed with her. 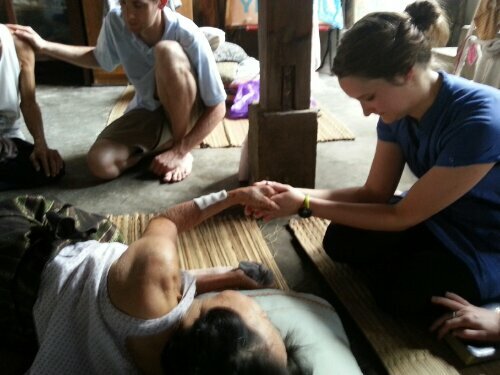 Please pray that she would have good fellowship around her and that she would not be hindered by pain. The second lady, Mae Pan, had never heard of Jesus. We shared how God created all the earth, including Thailand, and how he sent his son Jesus to die for our sins because we could never be good enough to earn God’s favor on our own. 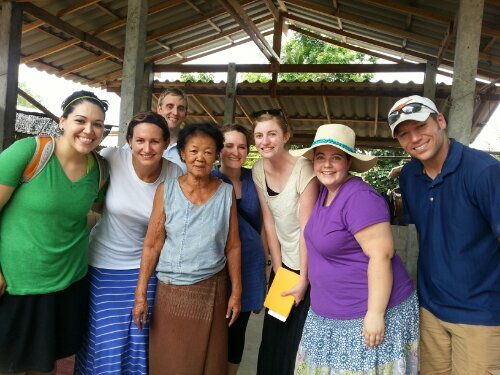 By the grace of God, Mae Pan accepted his salvation and prayed for Jesus to come into her heart! Please pray that God would fill her with his Spirit, and that he would show her his love, grace, and peace through Jesus. Pray also that her cold would be healed and her arthritis would be gone so she may walk without pain. The third lady, Mae Tee Ja Koo, was staying in an unfinished home next to her old house. She too had never heard of Jesus, but was excited to learn about him. 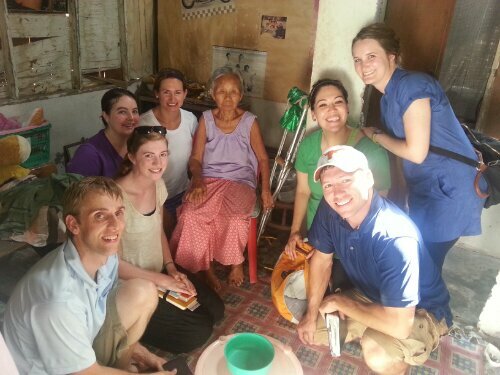 We shared the Gospel with her, and she asked many questions. 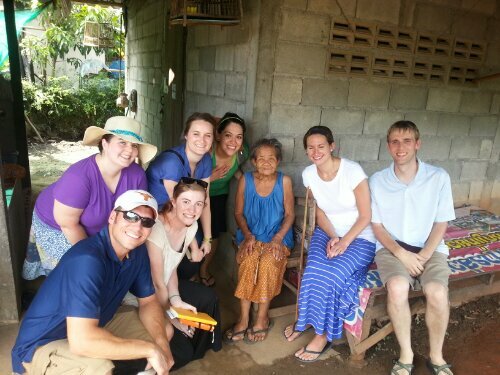 She was so excited to hear that Jesus would hear her prayers even if she prayed in Thai! So she prayed and asked Jesus to save her. 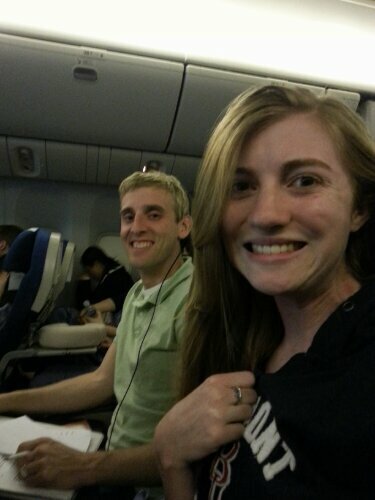 We gained another sister in Thailand! We also prayed for God to fill her with his peace and love, and when we were done she said she felt satisfied. All praise be to our God who is mighty to save! Please pray that God would provide the money to finish her house and that he would fill her with peace and that she would find her satisfaction in him and not her circumstances. The fourth family consisted of a daughter and her mother who is paralyzed from a stroke and her father who is hard of hearing. 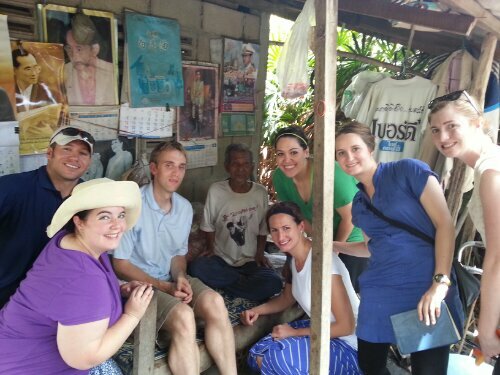 We were able to share the Gospel with Kanonit and her mother Chan Son, who had both never heard of Jesus. Kanonit was very interested but not ready to commit. She asked for a Bible and someone to study it with her every week. Please pray that God would reveal himself to Kanonit through his Word. Pray that her heart would soften further towards him and that she would turn to him for salvation. Also pray for healing for Chan Son. Our final visit was to a man named Khon Gin. He showed us how the nerves in his legs don’t work well and how hard it is for him to walk even a short distance. He has heard the Gospel many times and prayed for salvation, but he is confused about what salvation really means. He still prays to other gods; to him, Jesus is just another god like the ones he already worshipped. 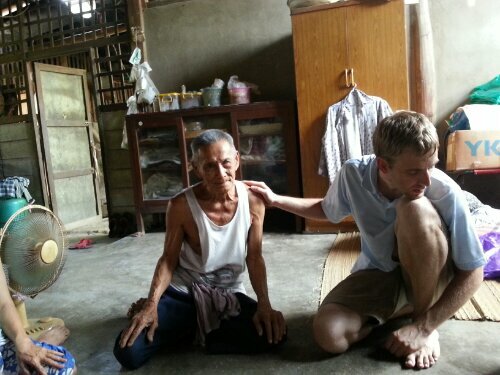 We shared the Gospel with him again and spent some time praying with him. 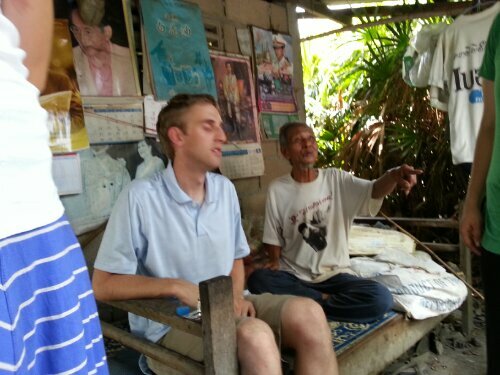 We could see the emotion on his face as we shared the Gospel; it’s clear he loves the story and wants to believe. 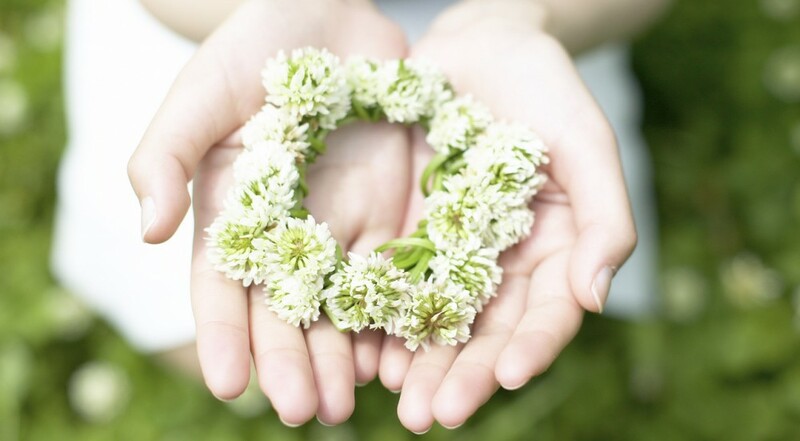 Please pray for clarity and for healing for Khon Gin. Pray that God would reveal himself to Khon Gin so that he would know that Jesus is the only God and he is worthy of worship. Also pray that God would bring Christians into his life who can help him understand God’s grace and forgiveness. God is already doing amazing things here in Chiangmai! Praise him for the salvation of two new sisters in Christ and a new friend who is willing to learn more about Jesus! Don’t stop praying for Thailand; the Lord has heard your faithful prayers and answered in a mighty way. And release from darkness for the prisoners…. 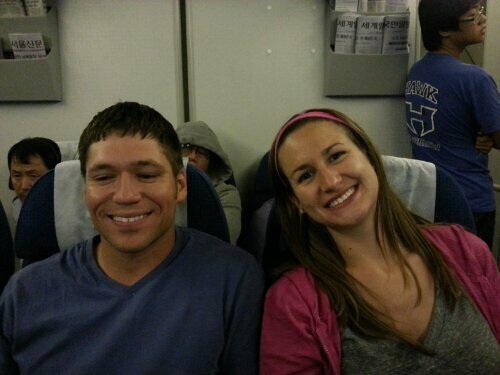 We are now 8 hours into our flight to Seoul, South Korea. It’s 8:00 pm back home and 10:00 am in Seoul. So far things have been going well. In some ways, it still seems surreal that we’ll be in Thailand in just a few hours, and in some ways, it feels more real than ever. We flew over Alaska several hours ago. There were about four of us staring out the window at the snow covered mountains. They were so beautiful! It was amazing how much detail we could see from 30,000 feet above – rivers, valleys, lakes, rock formations. It was almost like a painting. My favorite part so far (aside from the mountains of Alaska) was one of the meals. Korean Air served bibimbap! That’s a rice and vegetable dish seasoned with a spicy red paste and sesame oil. It was really good. I even ate most of the bamboo shoots. There was also a seaweed soup for a side. That wasn’t so tasty. The broth just tasted salty and the seaweed was an odd texture. Think rubbery. Basically:meh. Anyways, we’re all super excited to be on our way! Keep us in your prayers! Jesse didn’t want to take his eyes off his game. Too bad. His picture is getting uploaded anyway.